SunGard eSchool is a student information system that manages student information throughout their entire educational career. The KEMP LoadMaster is used to load balance the SunGard eSchool Server workload. The LoadMaster offers advanced Layer 4 and Layer 7 server load balancing, SSL Acceleration and a multitude of other advanced Application Delivery Controller (ADC) features. The LoadMaster intelligently and efficiently distributes user traffic among the application servers so that users get the best experience possible. 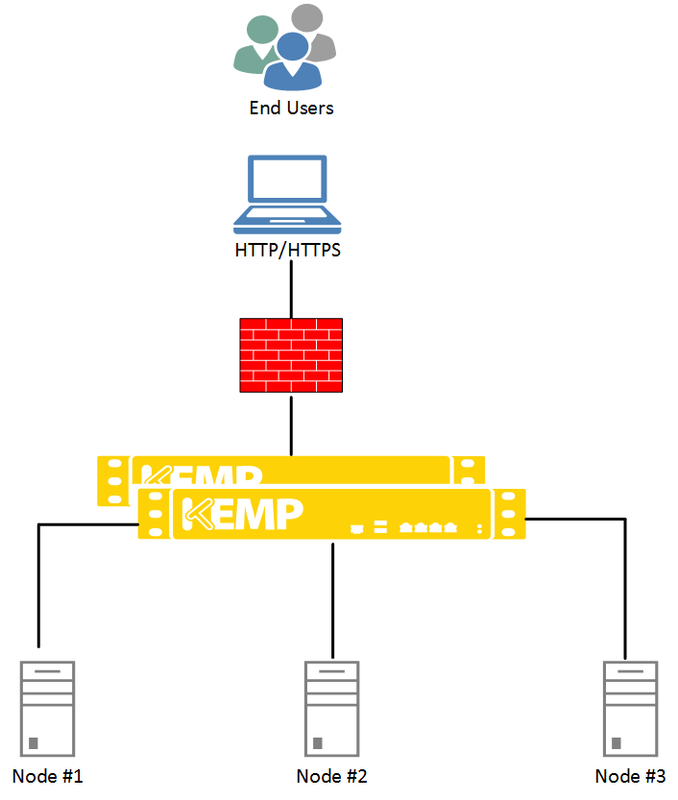 This deployment guide provides instructions on how to configure the KEMP LoadMaster to load balance the SunGard eSchool Server. The deployed SunGard environment determines which of the following setups is used. In a two-armed setup where the Virtual Service is on network/subnet A, for example, and the Real Servers are on network B - Subnet Originating Requests should be enabled on LoadMasters with firmware version 7.1-16 and above. When Subnet Originating Requests is enabled, the LoadMaster will route traffic so that the Real Server will see traffic arriving from the LoadMaster interface that is in that network/subnet not the Virtual Service address. 2. Tick the Subnet Originating Requests check box. The following sections describe the recommended settings for the SunGard eSchool Virtual Services. 3. Type 443 as the Port. 4. Enter a recognizable Service Name, such as SunGard eSchool HTTPS. 5. Select tcp as the Protocol. Persistence Mode Active Cookie You must have SSL acceleration enabled first. Clicking the Add HTTP Redirector button automatically creates a port 80 redirect Virtual Service. This is optional, but the purpose of this Virtual Service is to redirect any clients who have connected using HTTP to the HTTPS Virtual Service. KEMP also recommends changing the Persistence Mode and Real Server Check Method to None. 3. Type 1521 as the Port. 4. Enter a recognizable Service Name, such as SunGard eSchool Database ODBC. 3. Type 3389 as the Port. 4. 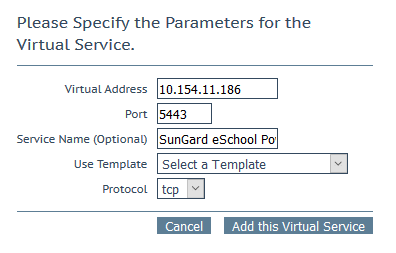 Enter a recognizable Service Name, such as SunGard eSchool Database RDP. 4. 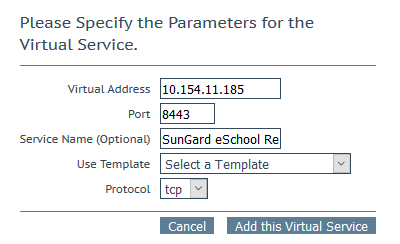 Enter a recognizable Service Name, such as SunGard eSchool Database Images. 3. Type 5443 as the Port. 4. Enter a recognizable Service Name, such as SunGard eSchool PowerTeacher. 3. Type 8443 as the Port. 4. Enter a recognizable Service Name, such as SunGard eSchool Report. Persistence Mode Active Cookie You must enable SSL Acceleration before you can select Active Cookie. 3. Type 2000 as the Port. 4. 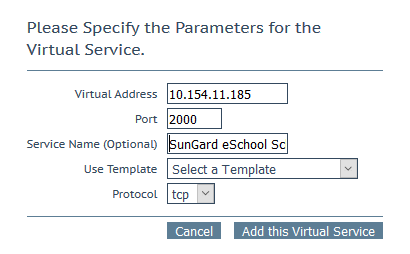 Enter a recognizable Service Name, such as SunGard eSchool Scheduler. This document was last updated on 01 November 2017.